Filling the Spectrum Pipeline « Steven J. Crowley, P.E. For the TV broadcasting spectrum, voluntary incentive auctions have long been on the horizon. Many broadcasters aren’t opposed to the idea in principle, but want assurances that existing or equivalent coverage is maintained during any channel repacking. For all they know now, it could be cut in half. This anxiety is heighted because the FCC refuses to make available for inspection pre-release versions of the software used to calculate a repacked channel plan. This refusal follows the FCC dismissing a noteworthy study prepared by the NAB on the wireless capacity crunch, and rejecting an attempt by broadcaster to try to innovate and experiment with new broadband technologies. Add to that the FCC Chairman being associated with a policy of marginalizing the broadcast industry, some broadcasters may rather take their chances on the next FCC. I think there may be another way forward. The Advanced Television Systems Committee (ATSC) is starting a process to develop a next-generation TV standard, ATSC 3.0. That new standard doesn’t have to be backward-compatible with current TVs. I suggest that as part of this standardization process the ATSC look at cellularization as a new architecture. Others have done this before, and the main objection has been it’s too expensive compared to the current single-transmitter model. It’s time to look at cellularization again, in light of less expensive cell site equipment and published work suggesting such a system for all broadcasters could occupy less than 100 MHz of spectrum, perhaps freeing up more than the planned 120 MHz. TV broadcasting could enter, and perhaps influence, the global LTE standards ecosystem with its economies of scale, its interoperability, and, crucially, its evolution. There’s also the potential for a return path. Looking at cellularization now might help avoid repacking the TV channels twice in a short time frame: following a spectrum auction and then again for ATSC 3.0. If such a cellularization scheme is seen as becoming practical, it could simultaneously result in a more durable strategic advantage for broadcasters, and more than 120 MHz for mobile broadband. There’s also the potential for a return path. Looking at cellularization now might help avoid repacking the TV channels twice in a short time frame: following a spectrum auction and then again for ATSC 3.0. If such a cellularization scheme is seen as becoming practical, it could result in a more durable strategic advantage for broadcasters, and more than 120 MHz for mobile broadband. Continuing our spectrum survey, the LightSquared proceeding will likely result in at least some of 59 MHz of spectrum around 1500 MHz becoming available, with the rest available once issues with potential interference to precision applications of GPS are resolved. The FCC has an open proceeding looking at maximizing the mobile broadband potential of a total 75 MHz of spectrum around 2 GHz. Some 40 MHz of that belongs to Dish Network, which recently asked the FCC for permission to deploy a hybrid satellite and terrestrial mobile and fixed broadband network. Qualcomm, Dish, and others have various smaller pieces of the 700 MHz band, some of which are in play now. An accurate and current inventory of frequency assignments and usage (based on measurements) would help identify new mobile spectrum, but the preliminary steps the FCC has taken so far are so laden with disclaimers they can’t be relied upon. Then we have the Federal spectrum. NTIA has issued a plan and timetable identifying over 2200 MHz of Federal and non-Federal spectrum that might provide opportunities for wireless broadband use. I wouldn’t call any of that “pipeline” at this point. NTIA is, however, finishing a detailed review of the 1755-1850 MHz band to determine to what extent it can be made available for commercial broadband use. This review should be completed by September 30. Since this band might be considered a best-case for repurposing Federal spectrum, the results of this review may give us a sense on how we’ll fare with other Federal bands. Anecdotal evidence suggests there is more Federal spectrum available. 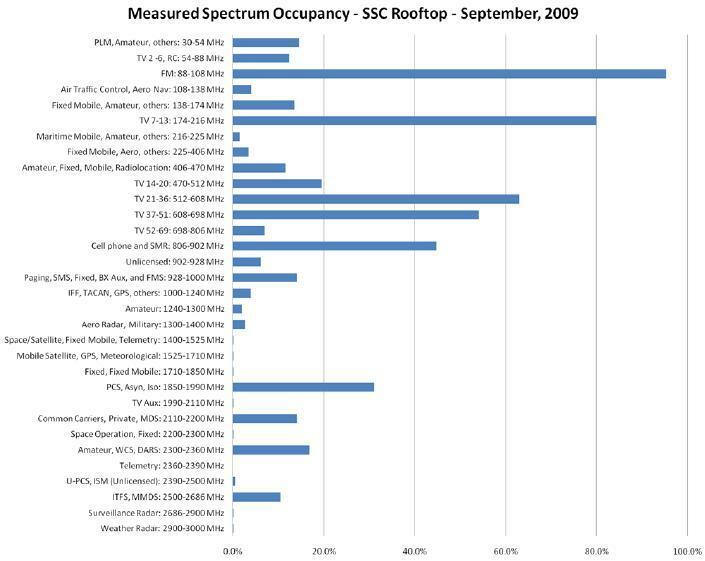 Below is a figure from a report prepared by Shared Spectrum Company, which conducted spectrum occupancy measurements at its suburban Washington, D.C. office. Shared Spectrum notes that, because of its methodology, some of these bands may be utilized but hard to measure, such as GPS satellite signals in the 1575 MHz region. Other fallow spectrum may be in a pipeline, but for services other than mobile broadband. One field test is not the basis for spectrum planning. These general results, however, have been replicated by Shared Spectrum elsewhere, and by NTIA at various locations. In addition to measuring what’s out there, one might think to examine the NTIA’s database of Federal frequency use to see what’s open. Unfortunately, the Government Accountability Office (GAO) recently reported that “NTIA’s data management system lacks transparency and data validation processes, making it transparency and data validation processes, making it uncertain if spectrum management decisions are based on accurate and complete data.” A new, improved database system is in the works but isn’t scheduled to be online until 2018 (not a typo). Other problems with the current Federal spectrum management process, as found by the GAO, include heavy reliance on agencies to self-evaluate and report their current and future spectrum needs, lack of specific spectrum management requirements for federal agencies, and limited assurance that federal agencies are recording accurate data. In a recent review of a sample of Federal spectrum assignments for one agency in the Detroit area, approximately half of that agency’s assignment records were inaccurate. There’s also a spectrum warehousing issue: some federal agencies are concerned that if they say they are no longer using an assignment, it will be deleted and they will not be able to get it back if needed later. The NTIA database problems point to another reason why a spectrum inventory, of Federal and non-Federal bands, should be informed by measurements. Repurposing existing databases known to contain errors, under layers of disclaimers, is not a spectrum inventory. Though not one of the usual spectrum candidates, it might be time to look again at the 1435-1525 MHz flight test telemetry band. This have been tried at least a couple of times before, by satellite radio and by land-mobile proponents. Both attempts didn’t get anywhere. This time I’d suggest looking at it with more of a goal toward sharing. I can’t help but notice that, today, the band is routinely shared under special temporary authority by video production entities looking for bandwidth to relay video during special events. One application was recently approved for an event in the middle of Washington, DC. If a hole is there why not use it for mobile broadband as well? I’d think . . . hope . . . that most flight testing is not done over major cities where the capacity crunch is the greatest. Flight test links are usually air-to-air or between air and ground, not ground-to-ground, so I’d expect considerable antenna discrimination that would reduce the potential for interference with other services. By the time we reach the National Broadband Plan’s 10 year deadline for 500 MHz of new broadband spectrum (for fixed and mobile), many promising technologies and techniques found in the record of the FCC’s proceeding on dynamic spectrum access will become a reality, increasing the capacity of existing spectrum. These will make it easier to implement shared spectrum use using cognitive radio techniques. Moreover, moves toward a property-rights regime for spectrum use and creation of markets for licenses, recognizing that government can improve market outcomes, would remove some of the headaches inherent in sorting out the above. We wouldn’t have to worry as much about filling the pipeline. It would fill itself. This entry was posted on Thursday, September 8th, 2011 at 9:16 am and is filed under 4G, Cognitive Radio, DTV, Dynamic Spectrum Access, Land Mobile, Spectrum, TV Broadcasting. You can follow any responses to this entry through the RSS 2.0 feed. You can leave a response, or trackback from your own site.